Eastleigh opened the new year fresh from a 24 day hibernation, and contributed fully to a thrilling encounter at the Raymond McEnhill Stadium. The Spitfires lengthy ‘holiday’, and this ensuing afternoon, offered definitive proof that the implementation of any winter break would be, frankly, horrendous. 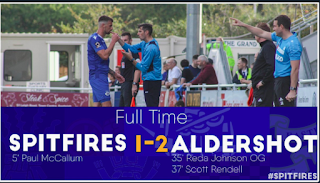 There were two debutants appearing for the visitors, with Alex Grant, on loan from Portsmouth, and Richard Pacquette brought into the side which lost at Dover last time out. Grant was part of a back-four which showed a worrying early tendency to defend too high up the pitch, so leaving themselves vulnerable to straight balls hit over the top. It was via that route which Salisbury fashioned their first chance when, from deep, Theo Lewis found Robbie Matthews who struck a first time volley too high. That early incident sparked a spell in which the home side created chances at will, the next of which in the 4th minute resulted in the opening goal. A low cross from Elliott Frear – giving a hint of the menace the Exeter City loanee would provide throughout – was allowed to travel across the face of the Spitfires goal for Jamie White to slide what was a soft finish past Ross Flitney. The ease with which the Whites were able to threaten was apparent again sixty seconds later, when a long punt from home ‘keeper Will Puddy almost released Daniel Fitchett. The hosts only had to wait a further minute for their next opportunity when Grant was harshly penalised for an innocuous looking challenge. A quick-thinking free-kick sprung the alert Lewis into space in the area, but as he tried to round Flitney, the midfielder – who was honest in staying on his feet under the ‘keeper’s attempts to stop him - could only run the ball behind. The hosts’ pressure was unrelenting, and ten minutes in White delivered an excellent cross from the right which Frear slammed into Mitchell Nelson and behind for a corner. From the consequent set-piece, Eastleigh’s second attempt to clear through a Nelson header only travelled as far as Lewis on the edge of the area. The midfielder, who was prompting much of his team’s good work, drove a volley from 12-yards low to Flitney’s right and in. At this stage, memories of the early season capitulation at Farnborough came to the fore. The Spitfires were struggling to gain any possession, and were reduced to hitting the ball high through the middle, where Whites’ captain Brian Dutton was dropping a few yards from his central midfield berth and dominating aerially. The visitors’ frustrations were encapsulated on 13 minutes by a late, slightly high challenge from Craig McAllister – recalled to start ahead of Lee Peacock – on James Clarke for which he was booked. Glen Southam received the same punishment five minutes later, apparently for dissent, after Salisbury had enjoyed another comfortable spell of possession. With nearly 20 minutes having elapsed, Eastleigh offered a first glimmer of purpose in their play. McAllister chested a forward ball into the path of Pacquette, but before the new man could get his strike away, Stuart Sinclair, demonstrating the tenacity and work-rate that was prevalent throughout his side, flew in to intercept. Buoyed, the Spitfires gradually began to piece together more cohesive spells of their own. Leigh Mills, employed in the centre of the field, excelled all afternoon with his anticipation, sharp tackling, and clever and quick use of the ball in tights situations. It was the one-time Spurs man who instigated a bright move when he nicked in front of Lewis to win possession and immediately feed Southam. The visitors’ captain hit a pin-point cross-field ball to Nelson on the right, but after the full-back cut inside he could only hit a left-foot cross, when well positioned, into the hands of Puddy. There was a brief scare for Eastleigh soon after when Flitney spilled a weak Fitchett effort, before scrambling to his feet and smothering the ball at the second-attempt. As the half-hour approached, earlier concerns about a resounding defeat were slowly being replaced by hopes that the Spitfires could find a way back into the game. The Whites were unsettled on any occasion when the visitors’ were able to get beyond the doughty home pairing of Dutton and Sinclair, and directly at their backline. Damian Scannell, operating on the right, was inching into the action and starting to unsettle the league leaders. The winger earned a free-kick high on the right after he determinedly forced a cross which was only blocked by an opposing hand. Jai Reason’s delivery was easily cleared but a pattern was being set. Two minutes on, and after a brief spell of keep-ball between the triumvirate of Grant, Southam, and Mills, Adam Everitt struck a cross from deep on the left. The ball drifted beyond its intended target, McAllister, but was retrieved by the tenacious Scannell who drilled firmly back across the six-yard box. With Pacquette closing in, Clarke could do no better than turn the ball into his own net. The goal imbued Eastleigh with genuine belief and fresh determination. They forced three corners in quick succession and it felt like only a matter of time before an equaliser arrived. 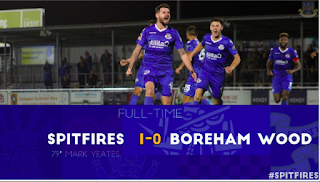 Instead, and typically of this frustrating season, just five minutes after grabbing their lifeline the Spitfires were two behind again. Grant’s loose defensive header was picked up by Frear, who nut-megged Nelson and drove away from him too easily. The wideman’s cross arrived for the ubiquitous White to sweep a shot towards goal, which with the help of a yellow shirted deflection left Flitney helpless. A word for Jamie White, who, when he played at the Silverlake on loan from Southampton under Ian Baird, looked fragile and out of his depth. Since that time he’s had an outrageously prolific year at Winchester City, started to enjoy his football again, and is a player transformed. Strong, mobile, and savvy, it is not difficult to understand why he is causing Conference South defences all manner of difficulties. After such a sucker punch it would have been easy for Eastleigh heads to drop, but this side have demonstrated more than once recently that they are made of far sterner stuff. The hosts had barely cleared their heads after the restoration of their two goal margin when Everitt won a free-kick on the left. Reason’s delivery was cleverly headed down by McAllister. So often this year we’ve seen the target-man win similar balls, only for the lack of a team-mate close by to render his work fruitless. Here, Pacquette showcased his goal-poaching instincts as he latched onto the flick and finished ruthlessly with a low first-time strike. Only a further two minutes had passed – and forty-one in total – when, incredibly, Reason scored the afternoon’s sixth goal, and delightfully, the Spitfires’ third. Another deep set-piece, this time from the right after a clear push on Pacquette, resulted in the ball being played into the box and then subsequently scuffed away to the number 10, where from 25 yards he hit a low left-foot shot which made its way inside Puddy’s far post to spark some delirious visiting celebrations. There was still time before the break for Eastleigh to nearly shoot themselves in the foot. Flitney spilled a simple catch and was nearly fatally robbed by White. Despite the ‘keeper’s protests that he had been impeded, Richard Hill left him in little doubt that the error was his own responsibility. After such a breathless first 45 minutes, it was little surprise that the action was slightly more pedestrian immediately after the interval. The first incident of note was a tactical switch made by Hill. Grant came off to be replaced by Michael Green who took up a position on the left of midfield. Reason moved inside in an attempt to get the Spitfires’ most creative force into play more, and Mills dropped to centre-half, where he was every bit as exemplary as in his previous role. The hosts provided the first attacking zest of the half when Frear skipped away from Southam’s careless challenge. The Eastleigh skipper was lucky the home winger stayed upright, as such an obvious foul would surely have brought a costly second yellow card. As it was, Nelson eventually upended the number 11 and conceded a dangerous free-kick to the side of the box. A fierce delivery ricocheted into McAllister’s chest and was hacked away, although how much the forward knew about his intervention was unclear. Soon after came echoes of the game’s embryonic stages, when a direct long ball was unconvincingly headed back towards Flitney by Mills, but not with enough force to prevent Fitchett nipping in and rolling an effort fractionally past the right-post. It was from a similar avenue that the visitors nearly broke away on the hour mark. Nelson won a robust tackle in his own half and quickly lofted the ball forward to Pacquette. Unfortunately the striker’s rustiness showed up as he was slow to react and Matthew cut out the danger. As time ticked on, the action became increasingly feisty with both teams showing no inclination to settle for a point. Reason, who regardless of being unable to exert his usual innovative influence, worked tirelessly, was staggeringly booked after chasing back to win possession in midfield. The home team, in contrast to early proceedings, were not being allowed to settle on the ball and patience was being tested in the home stands. Salisbury’s manager, Darrell Clarke, even became embroiled in an argument with one particularly vociferous dissenter. The hosts’ restlessness was close to being abated after a poor Tom Jordan header freed White on the Salisbury left. The attacker cut infield and curled a right footed effort across goal which passed inches by the far post. After that nerve-shredding let off, we could wonder if maybe for once on our travels this season, the Spitfires’ luck may be turning. Excruciatingly, that wasn’t to be the case. Nelson committed a foul on halfway, which could have seen him booked had Salisbury not repeated their effective and often-used tactic of taking the set-piece almost instantly. The ball was quickly lifted into the box and Sinclair skilfully chested into the path of Fitchett, who fired low and unerringly across Flitney into the bottom right-corner. Hill was not alone in his fury. Within minutes, the resilient Spitfires had almost levelled again. Everitt, who was energetic and made a number of incisive and intelligent runs forward during the 90 minutes, swung a cross onto the head of Pacquette. The forward’s header took a slight deflection onto the top of the bar and over. 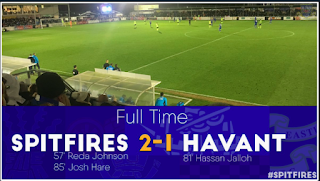 The former Havant and Waterlooville striker was quickly in the action again as he won a free-kick 40-yards from goal with Matthews climbing all over him. Southam showed similar inventiveness to that which we’d repeatedly seen from the Whites, and unexpectedly hit the dead-ball early to try and catch Puddy unaware. The home stopper managed to collect the ball just under his bar. After Frear had drilled a shot into the side-netting, Peacock replaced McAllister to provide a fresh and robust presence up front. Eastleigh continued to press and Pacquette won yet another free-kick. Green’s strike from 30 yards deflected off the wall and marginally over. The moment which ultimately decided the afternoon’s outcome arrived in the 80th minute. The Spitfires, continuing to play on the front foot in their search for a leveller, won a corner on the left. There was a resulting scramble in which, painfully, no yellow shirt could get a decisive touch on the ball before Puddy was able to gather. The ‘keeper, displaying excellent vision, threw to Charles Ademeno on the left. The substitute sprung forward at electric speed, carrying the ball fully 60 yards. As Mills tried to show the ex-Crawley man away from goal, he struck a fantastic low left-foot shot which Flitney could only watch fly across him and into his left corner. Still, Eastleigh wouldn’t lie down, and after some fine passing which saw play spread from side-to-side using the full width of the pitch, Reason slid a ball into Pacquette whose lay-off provided Peacock with a chance which he could only pull across the face of goal. Everitt sparked the next attack by winning a full-blooded challenge on the left and then exchanging passes with Green, whose delivery eventually dropped for Southam. The effervescent midfielder saw his firm shot from close-range bravely blocked. As the ball broke to Peacock he lashed it against the bar from 12-yards. It was hard to believe that only 25 minutes previously we’d considered that it might be our day. It wasn’t to be, but as on our last away trip to Dover there was encouragement to be taken from this performance. Finally the team looked full of chances, and Pacquette’s impact, despite a lack of fitness, was telling. It is imperative that the manager now finds a balance, whereby posing a goal-scoring threat doesn’t leave the side so open at the back. The return of Mark Hughes, suspended today, will offer the required additional defensive protection. With Reason, Southam, Scannell, McAllister, and Pacquette, offering myriad attacking options it is to be hoped that the wins quickly arrive, and see us firstly move away from the wrong end of the table, before our sights can be fixed upwards again.